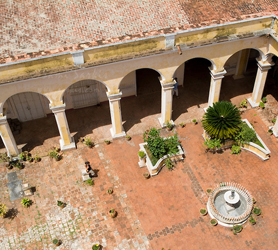 With more than 500 years of history in its streets, the beautiful museum city of Trinidad rises and transports us into another era; the colonial time during which counts, refined rich landowners, artists and scientists of the height of German Alexander de Humboldt established themselves in the city. Trinidad is, without a doubt, a true jewel of Cuba, the city of paved streets, the city frozen in time. Valley of the sugar mills is both a place of homage and the place where the rich made their money employing slaves to refine Cuba’s sugar. 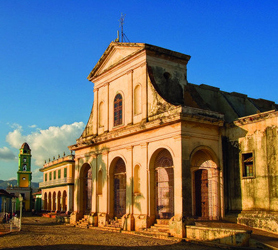 Trinidad Cuba is host to the Trinidad Holy Trinity Church, Trinidad Municipal Museum, National Museum of Archeology, Museum of Architecture, National Museum of Counterrevolution and the Romantic Museum. Like all Cuban coastal cities, Trinidad has its famous Playa Ancon Beach which is very popular with locals and tourists alike. 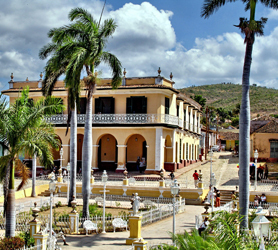 The city’s historic Plaza Mayor of Trinidad is the historic central meeting place of the townsfolk and also one of the most beautiful central squares in the whole of Cuba. In 1988, Unesco declared Trinidad and the Valle de Los Ingenios a "World Heritage" site.